A Copiosis enthusiast asked the following question on the Copiosis Social Page on Facebook. It offers an opportunity for us to better understand our innovation, so I’ve pasted my response here, with significant modifications and expansion for clarity, and broken into parts for quick consumption. This is part two. You can read part one here. Question: How does Copiosis deal with differences in individual belief systems? How are divergent beliefs incorporated when determining positive and negative net benefit? For example, a doctor (producer) provides a woman (consumer) with an abortion procedure. There would be vastly different opinions of whether or not this service was a positive or negative net benefit. How would such situations be resolved? I previously showed how the net-benefit formula and its variables are science- or fact-based. I allowed that some of these inputs can be informed by personal perspectives, but influencing the variables’ values from a personal perspective is difficult. I contrasted Copiosis as a freedom-based society with our current society, which offers a modicum of freedom while providing ample opportunity for some to radicalize our personal opinions, thereby creating wonderful income streams for themselves and others. Let’s get back to the topic of abortion. Let’s say a person wants to get an abortion, and another wants to offer such a service. The person wanting to offer the service is trained as a doctor and can competently deliver the procedure. A third party doesn’t want that to happen. Since we’d all be free to do what we want, it really isn’t any business of the third party whether the first person gets an abortion or not. The third party can join the payer organization and participate in a way that expresses her ideology. This person may, for example, act as an on-the-ground payer official ensuring those who (in a peaceful and productive way) counsel women on alternatives to abortion get their activity into the system. But if you look at the variables feeding the NBR formula, it seems relatively straightforward to expect the amount of NBR to be pretty small. It’s hard to prove that opposing abortion produces more net benefit than providing the procedure. I could be wrong here. The third party can organize a group to provide education, awareness, and outreach. This person could perhaps start a co-op whose mission it is to educate people about their perspective on the issue, and there are many such organizations today. Since necessities are provided to all at no cost and salaries don’t exist in Copiosis, making such an organization happen is easy. There may even be people who own and create necessities who will support this co-op and provide said necessities, and there may be others who won’t for the opposite reason. How long will people cooperate to conduct such activities when the NBR associated with such activities is likely to be so low? Those same individuals, no matter their personal perspective on the matter, could earn far more NBR doing so many other things that it seems to me the incentive to continue contributing their time and energy to such a cause would pale in comparison to things that could earn NBR and enflame their passions. The third party can expect to be selected for a Citizen Jury. These periodic opportunities offer the best chance for a person to have input on how the system works. On the juries, moral issues are debated and decided, and those decisions stick for a prescribed period. After that period, the decisions are reviewed in light of new information gathered in the period. Juries are randomized, so, given the size of the US, it’s not likely that this person would get on a jury frequently. He or she might get on a regional or local jury more often, but there will be others on the same jury, and it’s unlikely he or she will sway others if they disagree. Second, note that these juries, much like grand juries, rule based on science presented by experts. Experts may or may not include religious scholars, and it is unclear at this time how society will regard religion. That said, even if they are included as experts, other experts will also provide factual and science-based information for jury members to chew on as they deliberate. The third party can join with other people of like minds and create an enclave. The Net-Benefit algorithm and the Copiosis system can simultaneously operate locally, regionally, nationally, and globally, so it is possible for this person and others of like mind to create a community where such procedures are not provided. This seems to be the best option for a person who passionately opposes others’ points of view. By creating an enclave, the person doesn’t have to be aware of or affected by the expression of views that run counter to their own. Another laudable way for a third party to express his or her ideology is by demonstrating the attractiveness of their ideology by living it as a testimony for others to see, thereby attracting others to that ideology. Walking an ideological path as a means of attracting others has proven successful for all religious founders as well as their apostles and followers. Since necessities are provided to all at no cost, this could be an easy way to live one’s ideology, leaving ample time to earn NBR by pursuing one’s passions. The third party can encourage necessity providers not to support those who provide or consume such services. Any success in this approach, however, instantly creates a market for others who do not agree with the approach to create opportunities to circumvent such attempts. In other words, this approach could easily backfire. Finally, this person can demonstrate against, oppose, protest, and “fight” those consuming and providing such services. But thinking about the inputs and variables making up the net benefit calculation, what do you think the net benefit of such actions would be? 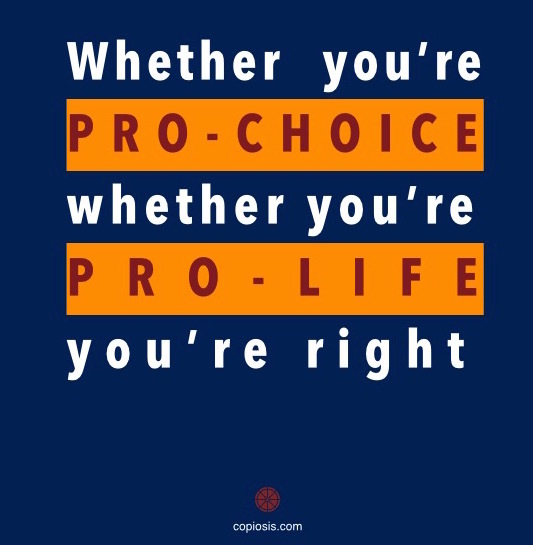 From a different perspective: let’s accept that it is against God’s will for a person to have an abortion, which, I believe is the main reason why people argue against such procedures. If I am right, isn’t God going to hold the persons providing the procedure and consuming the procedure accountable? Does God need intermediaries to mete out her will? In the end, we all will have to face whatever we believe awaits us after our passing. If a person is driven to getting others here on Earth to believe as he or she does, she or he is free to do so in Copiosis. Unfortunately, the benefit to society, individuals, and the environment will likely be so small that not much NBR will be earned through those acts. Better to find a more rewarding path. Allow others to live their lives. Live your own with your ideals. Pursue your happiness in the way you see. You are free. I think what will happen over time is that people’s belief systems will refocus on the person holding those beliefs. In Copiosis there will be no politics where such beliefs can gain power and control other people’s beliefs, let alone their actions. That leaves people who try to force others to believe as they do with many options and little result. This is long-winded and misses a key point that a woman seeks an abortion because she is terrorized by the thought of having to deal with a child or, in the least, being inconvenienced by it. Since it is now known that the health and happiness of a new human is somewhat dependent upon health and emotional well-being of a mother during pregnancy (as also after birth), it could be a most valuable thing for members of society to provide the healthiest and happiest and most honoring of services to a fellow human bringing a new person into this world — knowing that we will _all_ be rewarded with a society of happy future humans. TOP-OF-THE-SCALE rewards. Probably, few women showered with such attention could find any terrors in pregnancy, save a few cases. Stresses of raising a child may also be little where there is no want for necessities or educational-entertainment. Even if the mother wanted nothing to do with keeping the child, such society could also provide top-scale rewards for foster care, relieving her entirely of any present day type obgligations. Thanks for your comment “DG”. The person asking the question was specifically asking about ideological differences and how they are addressed. It was not a question about the plight of the pregnant woman. That being said, your comments are correct regarding how individuals who support the pregnant woman and the child would be rewarded. BUT: no matter what the decision of the woman – to get an abortion or have the child – if individuals supported her, they would still receive benefit, so long as the pregnant woman was better off at the end. I agree with you that if “villages” supported new-borns, then there would potentially be less stress in bringing a child into the world (for the mother). Yet, evidence seems to show that as societies and individuals prosper, birthrates go down. So, there may actually be fewer pregnancies in a world where women are freed from potential economic hardships that sometimes come with such situations.